Description: This is probably the very first modules that I built. It is 310mm by 210mm and pairs up with Peaceful Crossing for transport. The frame is made of 1" by 3" pine with a 1/4" luan plywood top. 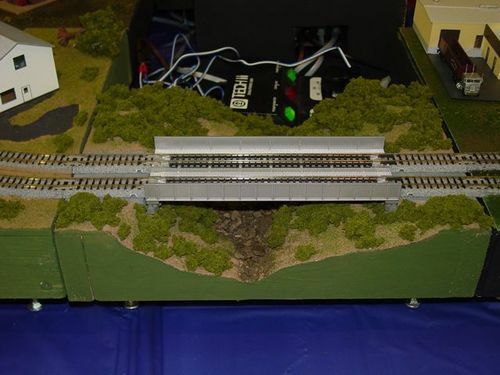 Kato didn't produce a double-track bridge of this size at the time, so I had to kit-bash this one from two bridges. This module was my first power module so that I could power the layout, hence the name.